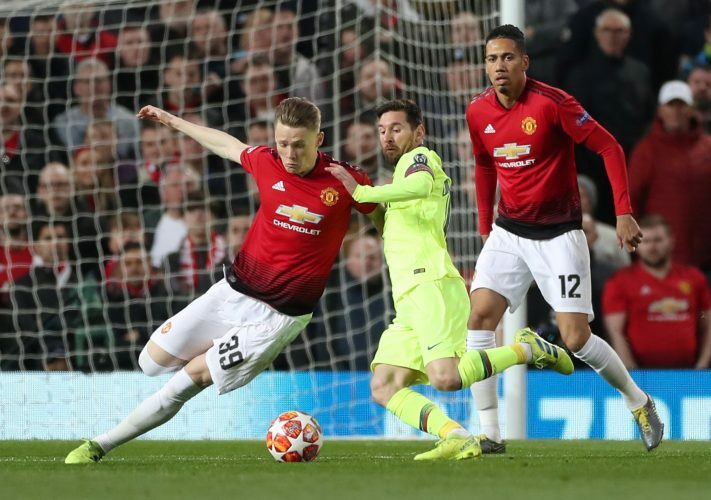 Despite facing a 1-0 defeat on the night, Manchester United were far from poor against Barcelona in the first leg of the Champions League quarter-final tie. The visitors bagged an early goal after Luke Shaw deflected a Luis Suarez header into his own net, but Ole Gunnar Solskjaer’s men fought back expertly, keeping the Catalans on their toes for the rest of the game. While Barca did enjoy a majority of the possession, the Red Devils were quite impressive in the middle of the park, with Fred and Scott McTominay dominating the proceedings. McTominay was especially singled out after the full-time whistle, with fans and pundits alike hailing the shift the 22-year-old put in against one of the best teams in the world. The Scottish youngster well and truly stood out in a midfield that consisted of the likes of Sergio Busquets, Ivan Rakitic, Arturo Vidal, and even Paul Pogba, which sums up the manner in which he played on Wednesday night. McTominay won all the tackles and aerial dues he attempted throughout the game, whilst also passing the ball well and taking on the opposition defenders fearlessly. Naturally, the world of Twitter too, had a lot to say about their youngster’s man of the match performance. Scott McTominay and Fred both brilliant again. Excelled against PSG and now Barcelona. They are the future. Easier to understand why #MUFC prepared to allow Ander Herrera to leave. Scott McTominay was utterly incredible. That’s one of those performances where you see a boy turn into a man. He looked like he’d been playing at the top level for years, and to say that against a Barcelona side with Busquets, Vidal, Rakitic is saying something. Wow. Some people not long ago insisted McTominay belonged in League One. Best game Fred and McTominay had for United. With Matic being poor and Herrera gone, that's good news for next season. Mourinho was bang on about McTominay. The huge plus in defeat for Manchester United was the performance of Scott McTominay. Mature and perfectly at home in a game of such significance. Excellent.